With the sealants and adhesives market flooded with options, sometimes it can be hard for your customers to know which product to select from the shelf and more importantly, if they can trust a product is going to do the job. 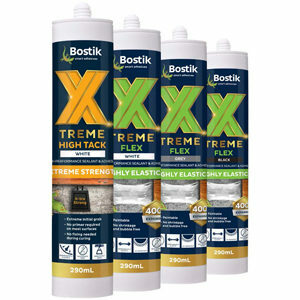 Bostik’s Xtreme Sealants and Adhesives simplify options on the shelf and in the toolbox. Utilising an emerging adhesive technology known as Hybrid Polymers, the Bostik Xtreme range combines all the best advantages of silicone and polyurethane technologies, yet boasts even greater bond strength. Bostik Xtreme also adheres to a very diverse range of substrates including wood, metal, plaster, plastics, masonry and glass, and will even bond these surfaces in the wet or underwater. Bostik Xtreme does all this whilst remaining less harmful than other products on the market. All products in the Xtreme range contain no solvents or isocyanates and are low VOC, meaning no more strong fumes whilst users work. The range includes four products: High Tack, Flex, ClearFix and Fire Seal; and each product contains the benefits above whilst also providing unique features to cover all jobs, big or small.